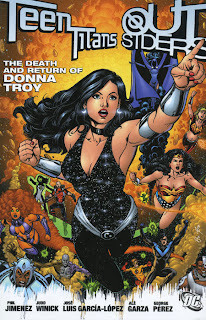 I read The Death and Return of Donna Troy in conjunction with the recent New Teen Titans: Who is Donna Troy trade paperback, and I recommend that everyone else do the same. Return is very nearly a direct sequel to the "Who is Donna Troy?" stories, and if you aren't familiar with the characters from the first, you'll be completely lost as to what they're talking about when they re-encounter one another in the second. That said, "Who is Donna Troy?" remains a classic, with the "classic" group of 1980s Teen Titans fighting alongside one another (and, if you've ever tried to understand how the Titans can be considered a "family" while the JLA's just a "team," count the number of times the Titans here tell each other how much they love and value one another before they go into battle), while Return is suffused again with much of that 1980s magic, if still a five-issue story compressed into only four issues. But there's a lot of Titans goodness here, especially for longtime fans, and in terms of Infinite Crisis, these books are absolutely essential.